Crystalline fertilizer, containing 21% of nitrogen and 24% of sulphur. Manufactured by «KuibyshevAzot», Russia. 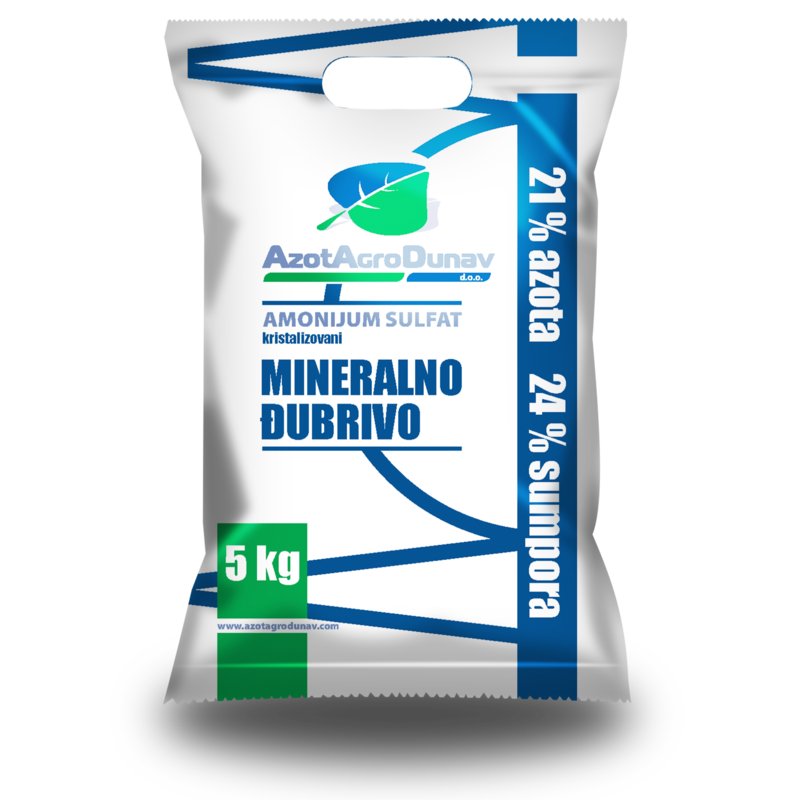 Russian ammonium sulphate in customer-size package (5 kg) from a Serbian storage. Sale of 200 kg to legal persons. Price RSD 300/5 kg (without VAT). Sale to natural persons «EKOMINERAL» tel. 026/651 427. For bulk buyers of 21,9 tons, a delivery by truck from Russia is possible, directly from the factory to the buyer’s storage in Serbia. Sale to legal persons from the storage in Smederevo (loaded in the client’s transportation means). Price RSD 1840/50 kg (without VAT). A discount is granted to bulk buyers of 1 ton. Sale to legal persons from the storage in Bogoevo. Sale of 1000 tons to legal persons. Ammonium Sulphate is a crystal nitrogen/sulphur fertilizer (contains 21% of ammonium N and 24% of sulphur). is one of the broadly applicable fertilizer in agriculture. AS can be applied for any type of agricultural crops (from potatoes to citrus plants) either to black or alkaline soils. Ammonium N of AS is easily assimilated by the plants. Sulphur is necessary for all crops as it forms a part of some indispensable amino acids synthesized by plants. AS is shipped in 50 kg valved polymer bags, bulk AS in special 60 t mineral fertilizer rail cars, in 20 t containers and in 64 t hoppers. AS may be transported by rail way, road trucks and by river/sea in covered containers in accordance with the rules of goods carriage applicable for the relevant mode of transport. Storage is recommended in closed rooms to avoid moistening of the product. Storage life and agrochemical worth: not limited.